We left Longreach early this morning and we had very strong cross to tail winds today. 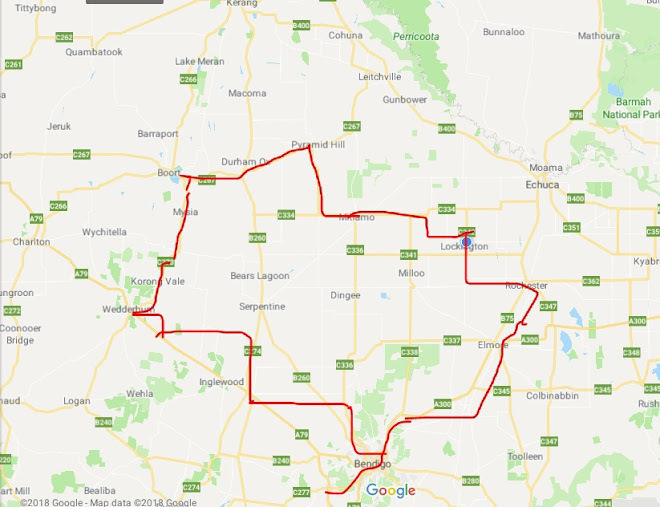 We knew that we were going to get cross winds to Winton as the wind was swinging from a south easterly to a predominantly easterly and continuing swinging to a north easterly. And like any wind here in the outback it is strong anywhere from 20 to 30km per hour! To add to our woes of servere cross winds (at least it wasn't a headwind!) which continuously threw us about with regards to road trains and caravans the traffic was horrendous for the first 30km, I suppose everyone leaves Longreach at the same time! It is also school holidays and there are alot more cars towing trailers at the moment. But it seems to be that there are a few NSW caravaners that just don't want to give us room on the road and continually come up along us very close or are just plain dumb and squeeze past us when another car is coming in the opposite direction instead of just slowing down - I reckon the caravaners that do that are the ones that are not retired and are actually on holiday as they seem to have that "I have to get past fast these cyclists as I only have 4 weeks holiday until I have to get back to work" attitude!!! But Neil and I go merrily along away and take it in our stride with these risky drivers and just curse and get over it! But one thing I HATE about cycling out here and fortunately we have been very lucky in not seeing this is the injured wildlife (it is bad enough seeing the dead wildlife) and during the busy time on the road we came across a small feral kitten that had obviously been knocked by a car (a truck would have killed it) and was stranded in the middle of the lane and as we cycled past we realised what it was and that it was still alive and I saw its' eyes and I nearly burst into tears and it was too busy to go and finish it off with a rock (and there wasn't any rocks about!) so we had to continue on in the knowledge that a road train would eventually finish it off. But those eyes haunted me for the rest of the day and night ... man I hate this part of cycling. 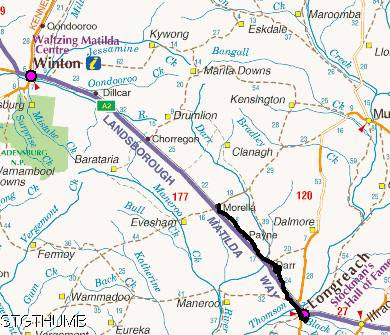 After about 30km the road just goes in 1 straight line towards Winton and there is not much deviation from that straight road (no kinks or turns or bends!). It was a hot day and our information showed that there was no water between Longreach and Winton so we left Longreach with 15 litres of drinking water and the knowledge that there was to be no British baths along the way! Although the information did say toilets there is no guarantee that the water tanks for the toilets will have bore water in them for us to wash - but that didn't worry us. We got to Morella which is around the 68km mark and just before it we could see a small QCWA building (Queensland Country Womens Association) and thought we would try there instead of the Rest Area which was close to the road and would be busy with road trains stopping through the night. So we camped outside the fence and we managed to get water from their rain water tank so we could have British bath and could restock on drinking water which was an absolute bonus! It was a lovely spot and as soon as we set up tent Kouta was in the tent asleep! We left the 2 doors open so the breeze could blow through as it was quite warm around 29 degrees so I think Kouta was just hot and knackered! So we had a relaxing afternoon of just sitting back listening to the radio and hearing the announcement that Australia may have a female prime minister tomorrow! In the evening it cooled down a bit and it was pleasant enough - dinner tonight was weetbix, banana, dried fruit and yoghurt! we have decided that it is easier to repeat the breakfast for out dinner rather than carry tinned fish, burritos, tomatoes etc as I was finding that that meal just wasn't enough or it wasn't filling so since I enjoy my breakfast I thought why not have weetbix again! We waited for the sun to set so I could get a photo and I have to admit it was a lovely sunset - very peaceful!